Dofus had always been a unique game. It was 2 dimensional, it had many classes which not one other game had, its community was amazing and it had a lot of amusing features. 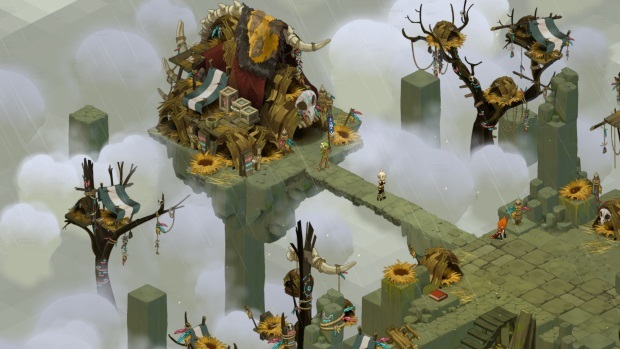 After the success of Dofus, Ankama decided to develop a game that had the good parts of Dofus combined with modern graphics and a new world: Wakfu. Even though the game is still in Open Beta, and it is still being developed, it is already popular and many former Dofus players decided to give the new game a try. They noticed many similarities with Dofus, but it was somehow different. They thought it was an amazing game, but could it beat the great reputation of Dofus? Right from the beginning of the game, you will notice that there are many differences if you would compare the game to Dofus. When logging in to the game, you will have to create your character. Sadly, you will only be able to change the color of your skin and hair which means that you will encounter many people ingame that look exactly like you. Keep in mind that Wakfu is only partly Free to Play. Most of the areas can only be accessed as a subscriber. Wakfu is a turnbased game, just like Dofus. This means that you will have to wait for your turn before being able to do anything. The combat of the game is not very complex. You basically have to wait for your turn and select a spell to cast. Attacks and movement is limited; It is not possible to kill all your enemies or to move through the whole map in one turn. Every player has an amount of AP (action points) and MP (movement points) to keep the usage of spells limited. Spells cost a certain amount of AP and moving costs MP. This is a great way to think very well before using a spell. Wakfu has 12 unique classes. These classes can also be found in Dofus. There are some small differences, but they are practically the same, which is pretty disappointing since many players expected more unique classes. Cra’s Range – They can be seen as the archers of the game. They have high range and they deal a decent amount of damage. The only problem is that their defense is low and they could use some more health. It is also a bad idea to fight monsters with spells, since Cra’s are vulnerable to magic. Ecaflip’s Coin – They are real gamblers. All their spells are based on their luck. Sometimes they are able to hit very high, but they can also do very low damage. Ecaflip’s Coin is a though class, especially for beginners, since they need decent stats to hit high. Eniripsa’s Hands – This is the healer class of the game. They are very flexible, but their damage is not very high and they really need good damage dealers in their party to keep up. Since they support their party members, they should focus on buffing and healing their friends. Enutrof’s Fingers – This class has a bit of everything. They mostly tank or support, but they also have some attacking spells. The only problem with Enutrofs is that their damage is very low, which means they are a hard class for new players. Feca’s Shield – A Feca’s Shield has a mix of defense spells and magical traps (glyphs). They are also a support class, since their frontal damage is really low. They should set up their traps and then start using their defensive buffs on their allies. Iop’s Heart – Iop’s Heart is often called the strongest melee class of the game. They can deal high melee damage to their opponents, but they also have a lot of health, which means that they could also be used as a tank. Pandawa’s Pint – The members only class of Dofus. This is one of the most amusing classes, because you are a panda and you can get drunk. What else do you want? When a Pandawa is drunk, it will be able to deal decent damage to more than one enemy. They have some AoE (Area of Effect) spells, but they are also able to carry their allies and they can even throw with them! Now, that sounds amusing, doesn’t it? Sadida’s Shoe – They summon dolls to protect themselves and their allies. Other than that, they also have a decent amount of offensive spells. It is the best to join a party when fighting harder monsters, because Sadidas are not able to resist a high amount of damage. Sacrier’s Blood – They have the highest amount of health, but they also can deal heavy damage. Sacriers are mostly used as punching bags, but I personally think they don’t really need a party. They can practically handle everything on their own. Sram’s Shadow – Many different spells is what makes this class so good. They can hide, set traps, clone themselves and deal magical damage. There are many guides on how to use this class, but none of them will make your character very strong, because it is almost impossible to deal very high damage with a Sram. Osamodas’ Whip – One of the most challenging classes of the game. Most Osamodas rely on their summons in a fight, but they also have the possibility to max a magical attack to protect themselves when all their summons are dead. Xelor’s Sandglass – A magical class that uses magical attacks to fight. Xelors mostly use their magical attacks to attack their enemy, but they also have some spells which allow them to steal AP from their opponent. The graphics of Wakfu are way better than Dofus’. The characters have been completely changed and the monsters look even better. The only negative part of this upgrade is that many players with an old computer will not be able to run Wakfu without any lag. Wakfu offers us quite some features. The game has PvP, but it isn’t really special. It basicly is the same as normal combat; The only difference is that your opponent is a real player. A great feature of the game are the professions such as harvesting and planting. There are many different professions in Wakfu. Some of these can only be executed if you are a subscriber, which is quite disappointing. The most unique part of the game is that the economy is completely player based. There are no NPCs who buy your items which means that it could go wrong if the players decide to ruin it. Wakfu is a decent game and a good sequel of Dofus. Anakma has done a great job on upgrading the game. The bad parts of Dofus, such as the graphics and many bugs, have been fixed and many players will enjoy Wakfu. I personally don’t think Wakfu has ‘beaten’ Dofus. Dofus will always be a great game that gives you everything you want of a game and nothing can change that. Not even a sequel.